Before a trio of true freshman put the college wrestling world on its ear, two veterans, past All-Americans, and NCAA finalists gave us something we don’t often get to see. What started as a little Twitter fun between Seth Gross (South Dakota State) and Bryce Meredith (Wyoming), who split matches two years ago when both were at 141, ended in a rare battle of top-ranked wrestlers. Gross, number one at 133, made his own weight then bumped up to clash with Meredith, the top dog at 141. It was a scramble filled bout with the Cowboy winning a third-period exchange to claim a 4-2 victory. Both wrestlers and both coaching staffs should be commended for making this happen. It provided a fun story for college wrestling and an entertaining match. We can only hope it inspires others to embrace the challenge. While the top performers this week didn’t have to leave their weight class, they still gave us plenty to talk about. Here are the 10 best performances in college wrestling this week! Few wrestlers have been able to stop freshman Taylor Venz (Nebraska) this season as the Cornhusker has climbed into the top-10 and stayed there. However, 15th-ranked Nick Gravina (Rutgers) solved the puzzle, taking Venz down three times and getting out from under Taylor, no easy feat, with a reversal. A win over the seventh-ranked wrestler in the country was key for the senior Scarlet Knight as he pushed towards All-American honors in his final go around. Gravina also had a 12-1 major decision against Hofstra on Friday. Tanner Hall (Arizona State) doesn’t lose much these days, entering the weekend 15-3 and ranked fourth in the nation. However, what we knew would be a tough stretch turned into a nightmare. First, longtime rival Nathan Butler (Stanford) ran his record against the Sun Devil to 4-2 in NCAA competition, eeking out a 3-2 win in the second set of tie-breakers, the fourth consecutive match between the two that need more than seven minutes to be settled. The next day, Amar Dhesi (Oregon State) earned his best win since returning from an injury that forced him to miss all of last season. The Canadian took Hall down three times in the first period on his way to a 9-5 upset, running his record in the series to 3-1. All three will vie for a Pac-12 title next month. 8) Who owns the MAC? Missouri has owned the MAC since leaving the Big 12, winning every conference tournament title and all but one dual. Thanks to Grant Leeth (149) and Canten Marriott (184), what was expected to be their toughest MAC dual of the season, against Central Michigan, wasn’t close. Leeth hasn’t lost since mid-November and continued his incredible run by upending third-ranked Justin Oliver, 3-1. It was his third win over a top-10 foe this season. By the time Marriott took the mat, the Tigers had won six bouts in a row. The redshirt freshman kept the momentum rolling with an impressive 9-1 major decision over 13th ranked Jordan Ellingwood. Missouri took the dual, 29-6. 7) What happens when a Badger fights a Wolverine? Andrew Crone (Wisconsin) kicked off his weekend in style with an upset over sixth-ranked Alec Pantaleo (Michigan). With the Badger leading 1-0 entering the third period, Pantaleo took neutral and set about trying to secure a winning takedown. Not only was Crone able to fend off the Vegas champion, he was able to counter a Pantaleo shot for a takedown of his own, finishing the match with a 3-0 edge. The senior continued his shutout streak on Sunday, stuffing Jake Tucker (Michigan State), 7-0. Pinning your man in 1:48 is a fine start to a college career, but true freshman Jason Renteria (Nebraska) had to wait nearly two weeks before taking the mat again. When he did this weekend, it was against two opponents expected to challenge him. He passed the tests. First, the Cornhusker handled Colin Valdiviez (Northwestern), 15-5, as Nebraska beat the Wildcats on criteria. Then, in the first showdown between Renteria and a ranked foe, Jason scored five takedowns, outgunning 12th ranked Scott Delvecchio (Rutgers), 14-11. That win kept Mark Manning’s team from sweating out another tie-breaker as Nebraska beat Rutgers 19-13. 5) The streak is over! Bonus points were key for Rider as they defeated Edinboro for the first time since joining the EWL prior to the 2013-14 season. The Fighting Scots had not lost a conference dual since then EWL member Pitt tripped them up in February of 2013. In ending Edinboro’s 24-match winning streak, Rider saw Tyson Dippery (141), Gary Dinmore (149), Chad Walsh (165), Dean Sherry (174), and Ethan Laird (197) all put more than three team points on the ledger en route to a 21-15 victory. The win gives the Broncs the inside track to the EWL regular season title. They can take another big step in that direction if they can beat Lock Haven next weekend. Fourth-ranked Logan Massa (Michigan) stormed out to a 6-2 lead on Nick Wanzek (Minnesota) on Sunday, but the Gopher senior swung the match with a six-point reversal in the second-period, then salted the match away with a pair of third-period takedowns. The 13-8 upset victory was Wanzek’s first win over a past All-American this season. Nick entered the weekend ranked 10th. Expect him to move up after building his resume as he looks to make a podium run in March. The demise of Ryan Millhof (Arizona State) has been greatly exaggerated. 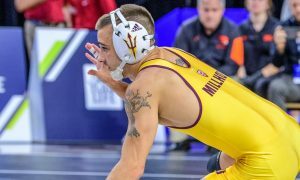 The 2016 All-American did not look himself in a pair of losses at the Cliff Keen and has had to medical forfeit out of two other tournaments this season. However, he shook off whatever had been ailing him to make this list along with fellow 125 Josh Kramer last week. This week, he kept it rolling with a 7-1 win over Gabe Townsell (Stanford) on Friday. On Saturday, he trailed number eight Ronnie Bresser (Oregon State), 4-3, as the clock ticked down before scoring a reversal with just six seconds remaining. Four nearfall made it 9-4 as the Sun Devils took a pair of conference duals. After a rough start to his college career, he was just 1-2 on the opening weekend of the season, true freshman Drew Mattin (Michigan) earned his way into the lineup and performed well in Vegas. After his performance this weekend, it appears he is continuing to improve. A 6-1 win over Johnny Jimenez (Wisconsin) on Friday was largely expected, but Sunday brought a showdown with 2017 NCAA finalist Ethan Lizak (Minnesota), who had shutout Mattin, 9-0, at the Cliff Keen. A late takedown from the Wolverine forced overtime, then in tie-breakers, Drew took advantage of the new rules, choosing neutral and scoring a takedown in the first 30 second period. He was able to stay off his back in the second half to secure the 4-2 upset. 1) Spencer Lee (Iowa) is TOM’s College Wrestler of the Week!